We met in an unusually empty bar in the rather posh Athanaeum Club, in the wake of the July 2005 London bombings. Usually, Bowman joked, ?it's full of sleeping Vicars, over in the other corner. The comment set the tone for the interview: he has a wonderful sense of humour, and humanity and humility. And loves talking. Determined to keep to musical matters, I vowed not to be sidetracked by his humorous anecdotes. But one, I have to say, is worth repeating. The time when in France, his billing as an alto meant that a group of viola enthusiasts turned up. How would he play the Schumann pieces, the Brahms or the Hindemith The venue for our interview, and the fact that I forgot to wear a tie dress-code for the club underlined one driving force of his career: his quintessential Englishness. In his teens his life?s ambition was to sing in the choir at King's College Cambridge an ambition to be fulfilled somewhat later, not least in his recording of The Messiah with Willcocks. He?s never been far from the Anglican Choral Tradition and he has returned to singing on Sundays in the Chapel Royal in London. ?I come from the English Cathedral Choral background; the English literary and artistic tradition? he confessed proudly, ?and much as I love the French, I wouldn?t want to live there?. Nor does he sing French Music, though he counts Debussy amongst his greatest musical enthusiasms. English Music is at the heart of his repertoire?lute songs, Purcell and now Britten, Tippett and some of their pastoral forebears. His admiration for English Song is at the heart of this recording, and he still regrets Britten?s early death: he would certainly have written for Bowman again had he lived longer. I asked him whether Purcell had a particular understanding of the counter-tenor voice. He thought not. More important was to transpose the songs into exactly the right key for your voice. We turned back to Britten, above all the composer who took the trouble to get to know his voice intimately, and this knowledge is reflected in the parts he wrote specifically for Bowman?The voice of Apollo, for example, in Death in Venice. In search of comments deeper than those which are biographical or anecdotal, I asked what it was that made his voice what it is? And why is it so different from the other counter-tenor stars, or indeed ?haute-contres?? His voice broke late, and he is adamant that it was important that he cultivated it before having tried out his bass voice. As a boy singer at Ely he developed a precocious envy for the alto parts of five-part voice-anthems by composers such as Weelkes and Tomkins, and so became a boy-alto rather than a boy-treble. He read Modern History at New College Oxford: ?I got a fourth?, he jokes, but confessed that the music making at the College and elsewhere in Oxford, ?in some wonderful concerts, and some awful ones? was invaluable experience. The counter-tenor voice was still very much a rarity, but it was also beginning to become a cult amongst Early-Music enthusiasts: Bowman was in the right place at the right time, with the right?more than right? attributes. He cut his teeth with three entirely different set-ups: firstly David Munrow, whose Early Music Consort limelighted him in repertoire spanning three centuries and captivated audiences at home and abroad, but particularly in the USA. After Munrow?s death, the EMC?s harpsichordist Christopher Hogwood founded the Academy of Ancient Music and gave Bowman the opportunity to explore the Baroque repertoire for solo voice?a recording of the Vivaldi Stabat Mater became particularly celebrated. Before this, Bowman?s involvement with contemporary music had also made a triumphant start, spearheaded by his successful audition for the part of Oberon in Britten?s A Midsummer Night?s Dream. ?One thing that helped me get the part was that I took the trouble to learn a section of the opera. The others just brought party-pieces?. Among other composers who have written pieces for him are Richard Rodney Bennett, Gordon Crosse, Robin Holloway, Alan Ridout, Geoffrey Burgon and Elisabeth Lutyens. He went on to take on more and more large-scale operatic roles for which his basic instinct as a ?show off? (his confession) carried him along, as did his ability ?to make a lot of noise?. Semele with Mackerras at English National Opera was a highlight, as were the Cavalli roles he sung for Raymond Leppard. He wasn?t a great one for teachers: it was just ?get on with it? in the early days. But what about the voice itself? Why, I wondered, was he so different from Scholl, or Esswood or an haute-contre such as Visse? Well you can hear I ve got quite a deep speaking voice. Talking to you now, quite quietly, is actually very good for warming up my voice. If I work on placing my speaking voice low, it gives a sort of cavern in which my alto voice can resonate. If you take those other singers you mentioned wonderful singers by the wayntheir speaking voices are much more like their singing voices. Mine isnt at all. He freely admits to a period in the 70s when his voice suffered a breakdown. It was in the wake of the deaths of both Britten and Munrow, and came at a period when he was clearly doing too much. He worked on it with Barbara Alden. How did the voice re-emergeWith a much more secure technique?, he judged, ?And with far more colours. You know I was all bright and boyish when I was younger, now the voice had darkened, and I had lost a bit at the top?. He studied with Lucy Manen when younger but his most influential teachers have clearly been those with whom he worked, from the cathedral choirmasters, through professional colleagues (Pears was a particular influence: such generosity to younger singers) and also instrumentalists. I think of myself in some ways as instrumentally oriented. I learn particularly from baroque players, their phrasing, bowing, the way they shape bass lines. Sometimes I feel I interact more with instrumentalists than with other singers. 't seem a happy thought. I m not much good at teaching?, he mused overmodestly, but perked up at the idea of masterclasses. He seemed particularly keen on coaching singers away from his own repertoire: Wagner, Debussy One things for sure: hed always have something to say. All the pieces on this recording were chosen because of their connections with people, events and places that have influenced my years as a singer; they form a musical panorama showing the different stages of myself as a performer, from church music to the opera stage. As a chorister at Ely Cathedral in the 1950s we sang a great deal of plainchant. The Sunday morning Mass always contained chanted items and the office hymn at our daily evensong was always sung to the appropriate plainchant setting. Although ours was not the Roman Rite, I wanted to include the Salve Regina as this is plainchant at it best. I was introduced to the songs of John Dowland by the late Robert Spencer, a wonderful lutenist and teacher of English song. His knowledge of Dowland was unparalleled, and he taught me all I know about lute songs. Being a singer himself, he understood the importance of words as well as melody. If my complaints could passions move shows Dowland at his melancholy best. The accompaniment is played here on the Ottavino or spinetta ottavina, an octave spinet, extremely popular during the 17th and 18th centuries. Purcell has always been central to my repertoire, as indeed he should be to all Counter tenors. Here the deities approve the God of music occupies a very special place on this disc, as it was the first piece of Purcell that I ever sang in public, in 1956 to be precise. My school at Ely had a very enlightened Director of Music, Dr Arthur Wills, who was also Cathedral Organist. For our Summer concert he proposed a performance of the Purcell Ode Welcome to all the pleasures from which this air is taken. A guest Counter tenor was engaged from one of the Cambridge College choirs to sing the alto solos, and I was a member of the chorus. However, at the last moment, the visitor from Cambridge became unavailable, and I was deputed to sing in his place. Although I was actually still singing on the remains of my Treble voice, the Counter tenor range was beginning to appear and it was the moment when I decided that this was the voice for me. 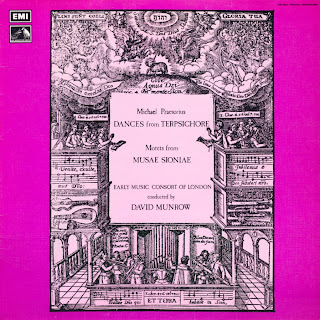 The other Purcell songs in this group, Sweeter than roses, I attempt from loves sickness to fly and Fairest Isle were all particular favourites of my great friend and colleague, David Munrow, who sadly died in 1976. He loved Purcell and also the voice of Alfred Deller; he claimed that Alfreds recording of Sweeter than roses introduced him to the beauties of Purcells Music. Many of our programmes with the Early Music Consort contained one or more Purcell songs. Handel is obviously another key figure. He wrote very little for the male falsetto, preferring to concentrate on the Castrato voice. However, with the disappearance of that voice, the field is open for the Counter tenor to explore the Alto castrato repertoire. By great good fortune the two voices occupy virtually the same vocal range, namely low g to high d. Female singers tend to find this a little low, but it is ideal for the Counter tenor. The title role in Giulio Cesare is a good example of this. Handel wrote many Italian Cantatas, of which there are a number for the Alto voice. In most cases the texts are inconsequential, the usual vapid declarations of unrequited love, but the cantata Ho fuggito amore has a strong text written by Paolo Rolli, who wrote opera libretti for both Handel and Bononcini. The aria Tacer, pur che fedele is a little gem from Agrippina. It is set over an almost Purcellian ground bass with no closing ritornello just a self contained moment of reflection, sung by Ottone in the midst of a very turbulent drama. It is an ideal piece for a recital programme. Edmund Rubbra was a familiar figure to me during my Oxford student days; I encountered him socially on several occasions and found him to be a delightful person. His Hymn to the Virgin is a setting of anonymous medieval words, originally composed for soprano and harp. The vocal line declaims the medieval text, but clothed in a 20th century idiom. Ralph Vaughan Williams did not write any solo music for the Counter tenor voice, but his widow, Ursula assured me that, had he been acquainted with the present generation of Counter tenors, he would have certainly been inspired to write for them. A composer with his roots in music of the Elizabethan era must surely have responded to a voice from the same background. Be that as it may, a simple piece such as the Woodcutters Song from his Opera, (or Morality as he preferred to call it) The Pilgrims Progress is ideally suited to the Counter tenor voice. I have always loved Vaughan Williamss music and am glad of an opportunity to sing it. And so to Britten, the single most important figure in my early years as a singer. Having auditioned for him in 1966, he literally dominated my life for the next 10 years until his untimely death in 1976, the same year as the untimely death of David Munrow. I sang the role of Oberon in his opera A Midsummer Nights Dream countless times in ten very different productions, perhaps the most notable being the version by Peter Hall at Glyndebourne. Oberon became my alter ego, and I have never felt so at home in any other role. I can still recall the thrill of singing the part for the first time at the Royal Opera House, Covent Garden, with the John Piper sets from the original production. It is only natural that I should include that moment of pure magic, the aria I know a bank, where the wild thyme blows where Brittens genius speaks for itself. I first heard Brittens haunting arrangement of The Sally Gardens at the Aldeburgh Festival, sung as an encore by Peter Pears accompanied by Britten at the end of one of their unforgettable duo recitals. I was immediately captivated by it and I remember asking Peter if it would suit my voice; always the kindly mentor, he encouraged me to learn it. I find the songs of Peter Warlock endlessly fascinating; they are by no means easy to sing, as he makes quite severe demands, but the end result is invariably satisfying. His pungent, quirky accompaniments are a constant delight, and his setting of Hilaire Bellocs The Night captures perfectly the wistfulness and yearning of the text. I first encountered the piece while at school preparing for a grade examination; I rejected it then as being too difficult. Michael Tippett was always an enigma to me; his music, as far as I am concerned, has never been as accessible as that of Britten, and his writing for voices often seems unnecessarily wayward. He was undoubtedly a genius, but I never felt he entirely understood the human voice. I was directed by him in concert on several occasions, (I recall a particularly odd performance of the Monteverdi Vespers ? his conducting skills were somewhat unorthodox, but there was no doubt of his love for the music). However, he was the man who discovered Alfred Deller at a memorable audition in Canterbury and thrust him into the limelight; for that fact alone one is grateful to him. After Alfreds death, I went down to Wiltshire to interview Michael; he talked a great deal, but I came away none the wiser about his feelings toward Alfred. I have included the Songs for Ariel for the simple reason that they were written for Counter tenor and first performed in a production of the Tempest at the Old Vic. They have an attractive, whimsical quality about them which makes them instantly accessible to an audience. Herbert Howellss King David is one of those pieces that all English singers know and respect, even if they have never actually performed it. It is arguably his most famous composition, despite his prodigious output in the field of Anglican Church music. As a singer of Church music I have sung much of his repertoire; there are many fine moments, such as his setting of the canticles for Kings College, Cambridge, but sometimes Howells can be somewhat overblown and verbose. Not so in King David The song is a model of economy and restraint, perfectly conjuring up the healing power of music. I first sang it in Westminster Abbey at a memorial service for the late Christopher Palmer. Andrew Gant (b.1963) is the only living composer here recorded. He holds the title of ?Organist, Choirmaster and Composer of Her Majestys Chapels Royal and is the present incumbent in a long and distinguished tradition. As a member of the Chapel Royal choir myself, I am therefore answerable to him and under his direction. In 2002 he wrote me a fine song cycle entitled 10 Musicians, the musicians in question being connected in some way with the Chapel Royal. Epitaph for Salomon Pavey is a setting of a touching poem, telling of the premature death of the celebrated child actor and singer from the Chapel Royal. His fame, even at the age of thirteen, must have been considerable for his demise to be lamented by none other than Ben Jonson. Anthems in Eden from Wikipedia..
Munrow, and the Hurdy Gurdy..